Amy Brenneman (Private Practice, Judging Amy, Heat) and I co-created this piece, based on Amy's personal writings. 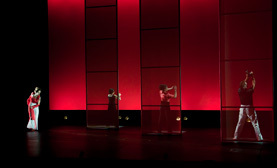 It explores the ecstatic, excruciating, humorous dance between the sacred and profane in Amy's own life. Her spiritual curiosity has taken her from a Buddhist temple in Nepal to an Evangelical church in the Mississippi Delta to the red carpet in Hollywood. But it was in a recent hospital room that her beliefs were most powerfully tested. As it traces Amy's journey through a debilitating illness, the piece celebrates the sorrows and the joys of being human, finding divinity in surprising places and ways. "Because of my confidence in and respect for Sabrina's integrity as an artist, the A.R.T. was pleased to present a special engagement of Mouth Wide Open. Sabrina has worked with Amy to create a performance that is personal, humorous and powerful and was very well-received by audiences. It is a great example of Sabrina's ability to use movement and dance to amplify emotional truth, reveal unspoken aspects of a character and tell a story." 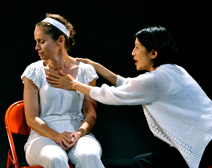 "I have known Sabrina Peck ever since she was a Harvard undergraduate and was electrifying the theatre community with her imaginative direction and choreography. She has since gone on to do some really dazzling professional work, the most recent that I saw being Amy Brenneman's deeply moving Mouth Wide Open. Sabrina is that rare thing, a theatre artist with her own vision, yet deeply attentive to the vision of others. I applaud her and her work." 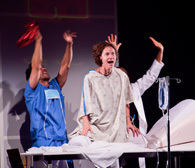 Mouth Wide Open was first performed at The Yard Performing Arts Festival on Martha's Vineyard for three performances in July, 2010, the culmination of a two-week developmental residency.